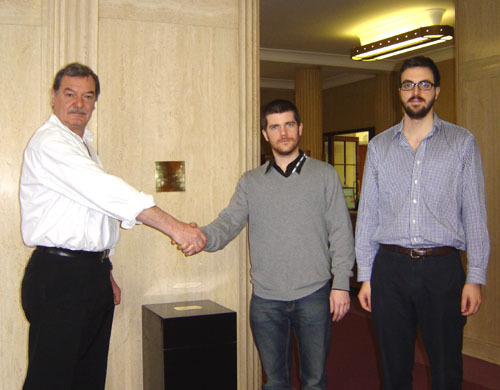 For their residency at the National Institute for Medical Research, The Miller and McAfee Press created an archive or time capsule-like device that contained artefacts, documents, and contributions from members of staff from NIMR. 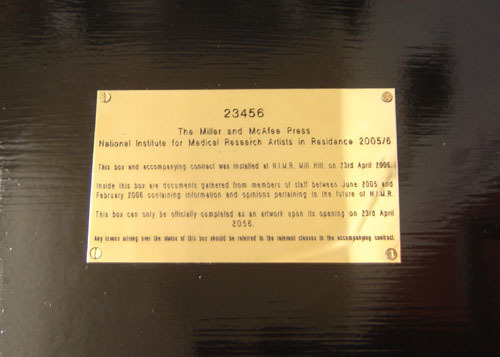 On completing the residency, the artefacts were sealed into a black box and a contractual agreement was made between the artists and NIMR, signed by The Miller and McAfee Press and John Wills, Assistant director of the Institute. 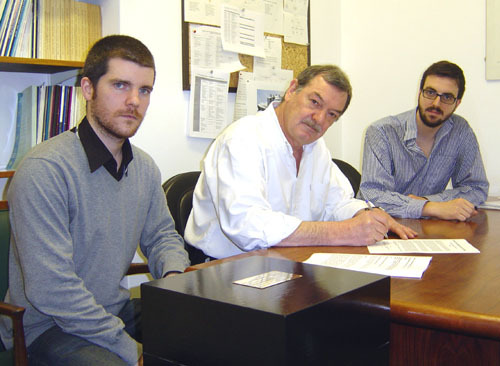 The contract stipulates that the box will only become an artwork once it has been displayed within the building of NIMR or the inheritor of its estate for the next 50 years. Thus the title of the work describes both the date upon which it is due to be opened and the date that it will become complete as an artwork. The black box represents a structure that possesses critical information, but also appeared as an empty void, a black hole perhaps. This paradox reflects the nature of the archive and thus the nature of our residency. On the one hand potentially invaluable, on the other completely useless. The value of our activity is open to question, but equally the value of any activity based upon an immediate judgement is also up for question, and so on this level the Black Box which houses the results of our residency asks for a suspension of judgement.